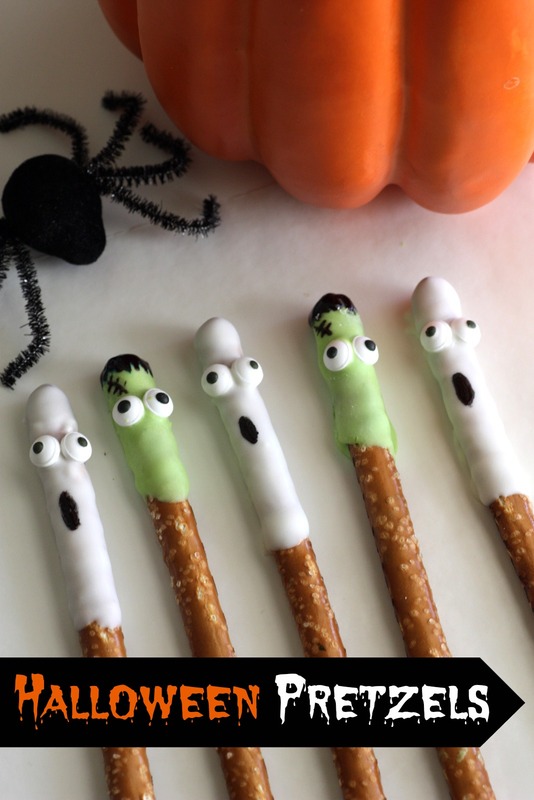 These ghost and Frankenstein Halloween white chocolate covered pretzels were so fun to make, and I loved how they turned out! 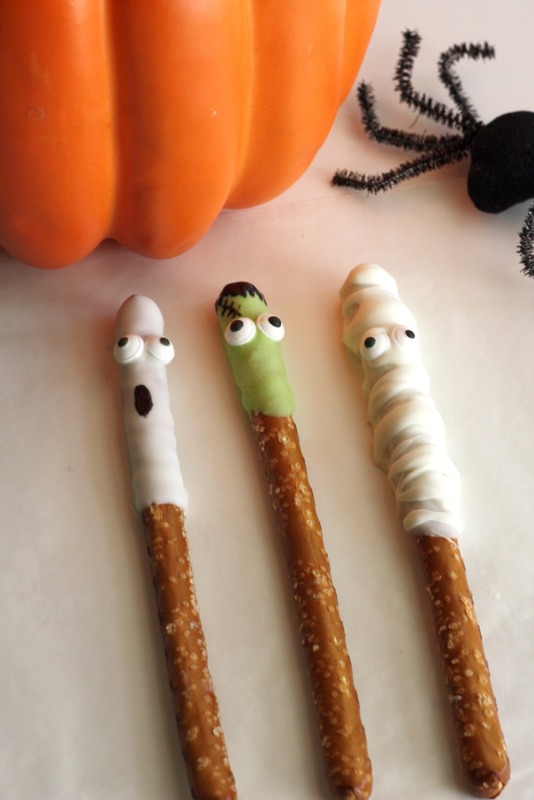 These would be perfect to serve at your upcoming Halloween parties. And look, I even added a mummy! Melt white chocolate in 30 second increments, stirring after each one. Using a spoon coat pretzel. I covered about 1/3 of the pretzel with the chocolate. Let excess drip off. Place on a sheet of wax paper. As the chocolate start hardening a little, add two eyes. You might have to hold them in place for a minute to make sure they stick. 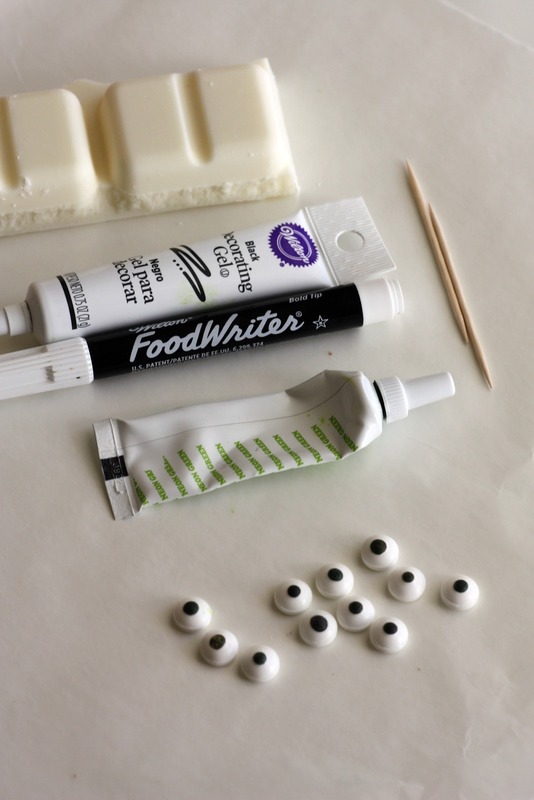 Once white chocolate has cooled, use your black Food Writer marker to draw a mouth on the pretzel. Add neon green food coloring and mix. Using a spoon, coat pretzel. 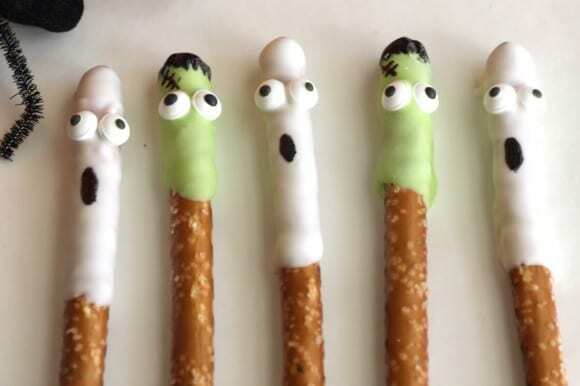 I only covered 1/4 of the pretzel because I wanted the green white chocolate to look like a head. Once white chocolate has cooled, use your black Food Writer marker and draw hair and a scar on top of the Frankenstein head. My Food Writer ran out so I used black decorating gel and a toothpick to add hair and scar. Using a spoon, coat pretzel. I covered about 1/3 of the pretzel with white chocolate. Let the excess drip off. Use a spoon and drip "bandages" across the mummy. If you make some, please send me photos to jillian(at)catchmyparty(dot)com. I'd love to see how yours turned out!